A seventh-grade science project is credited for sparking Southern Illinois University Edwardsville School of Engineering senior Yelana Moton’s interest in engineering. That spark ignited a strong passion for the industry, and started Moton on an academic journey from which she hasn’t wavered. Her final steps toward completing her bachelor’s in construction have been aided by a $2,000 scholarship from the Concrete Council of St. Louis. The Concrete Council presented the award to Moton at the Annual Concrete Council | American Steel Fabrication Quality Concrete Awards Dinner on Thursday, Nov. 1 at the Missouri Athletic Club in St. Louis. The Concrete Council of St. Louis hosts an annual golf tournament, which is sponsored by Fenix Construction Company, to raise funds for college scholarships. The $2,000 annual award is presented to a student(s) from the St. Louis area entering their senior year, who is deemed most deserving and best able to utilize knowledge of concrete construction in their career. 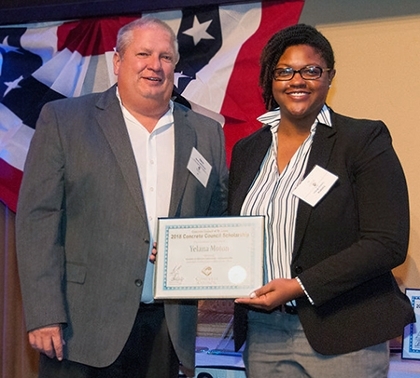 Moton has been an active member of the Student Chapter of the American Concrete Institute at SIUE for more than three years and is currently president. She points to her participation for enlightening her on the efficiency of concrete and expanding her network. Moton is slated to achieve her bachelor’s in construction during SIUE’s commencement ceremony on Saturday, Dec. 15. Photo: SIUE senior Yelana Moton (right) was presented a 2018 Concrete Council Scholarship at an awards dinner held Nov. 1.